NEW YORK — CEOs of the world’s biggest oil and natural gas companies are pledging to cut their emissions of methane, a potent greenhouse gas, by one-fifth despite staying silent on the Trump administration’s regulatory rollback on the matter. Why it matters: The announcement made Monday by the Oil and Gas Climate Initiative, a group of top oil companies that represent nearly a third of the world’s oil and gas production, is a significant move given methane's impact in warming the planet is far greater in a shorter time span than carbon dioxide. The big picture: Cutting methane emissions is one focus of the group, which now includes ExxonMobil, Occidental Petroleum and Chevron. The other pillars include carbon capture technology and cutting emissions in the transportation sector. Yes, but: In interviews with Axios and during a public event in New York on Monday, several oil executives declined to comment one way or another about the Trump administration’s rollback of two parallel regulations — one at the Environmental Protection Agency and another at the Interior Department. At Monday's public event, Ken Alex, a senior advisor to California Gov. Jerry Brown, asked the CEOs if they would state their opposition to Trump's moves to scuttle the regulations? They opted not to do so. 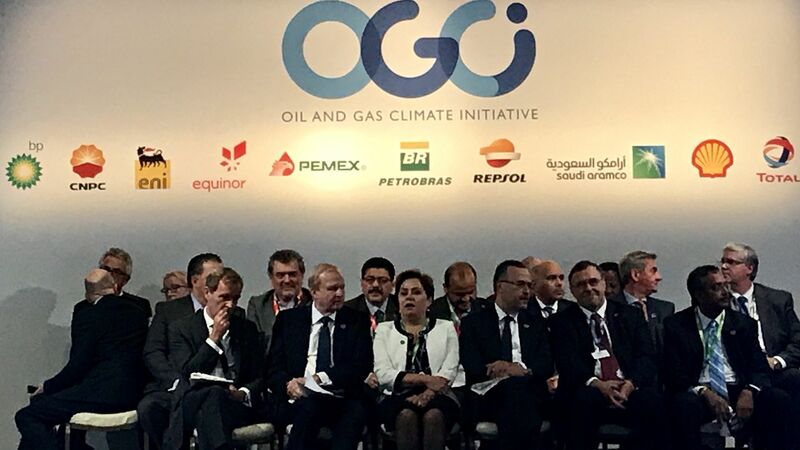 “The commitment to reduce methane emissions to these low levels and to measure it and record it is a big step forward and I think it proves that OGCI is not just talk but action,” said Fred Krupp, president of the Environmental Defense Fund.